It was a sunny Tuesday evening. There were waves of wind rolling through the feverish red tulip fields. All the tulips seemed to point their heads in the same direction: that of the big hall at the end of the lane. There were chills running down my spine of pure excitement. In less than an hour I would walk into that hall and dive behind the scenes of the flower parade only to come out again three days later. I had a hunch, an idea, of the amazing creations I would find there, but wasn’t prepared for the things I would see. Last years I’ve been going through the area around Keukenhof by bike and each year I discovered new places, hidden treasures. 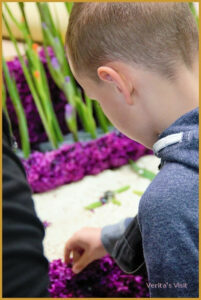 I’ve never been in this hall or behind the scenes of the Flower Parade in the Keukenhof area. As soon as I enter the building, my jaw drops and my eyes open wide. Spread throughout the hall are enormous objects made out of the kind of foam you want to pinch your finger in to see if it is as fluffy as it looks like. All kinds of building constructions are made around it so the volunteers are able to reach the higher parts easier. There are crates full of hyacinths, orchids, daffodils and tulips and boxes full of staples are waiting to be used. Above all there are volunteers walking around everywhere and there is music and a place to sit and have a drink. Even though this hall is huge, all these things add up to a relaxed atmosphere and give a very homey feeling. 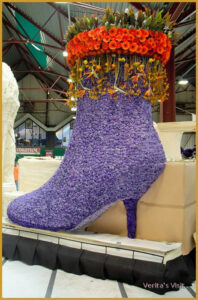 Verita goes behind the scenes of the flower parade from Wednesday 10 April till Friday 12 April 2019. Want to join her on a cycle tour or just for a visit behind the scenes? Contact Verita’s Visit Holland for more information. 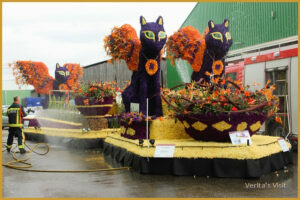 Who is the flower parade winner? But, don’t let appearances fool you. There’s a lot to be done. While I’m touring my English, Dutch and Russian (?! 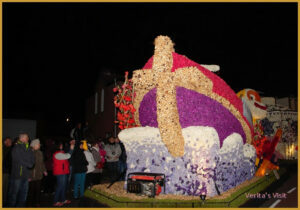 )- speaking groups around and tell them about the history and the making of this 69th edition of the 2016 Flower Parade Bollenstreek, there is a competition going on. 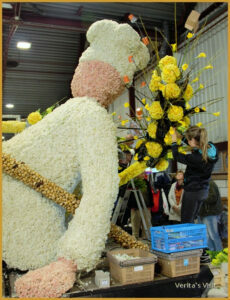 All the floats and flower arrangements and decorations have to be done before Friday morning. The volunteers, all from different associations and clubs in the area, work day and night to finish their project. 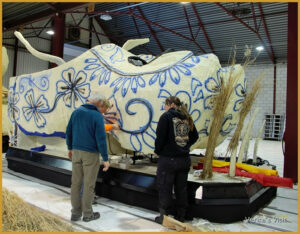 Every part of the float has to be perfect, because besides fun, every team also hopes to win the first prize. So, the teams are definitely under pressure, which can be sensed in the air, especially Thursday evening, when the deadline comes closer. On Friday everything is done, all construction is gone, everything is cleaned and the last preparations for the Flower Parade are being made. 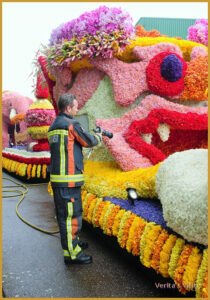 The air is literaly being cleared, as fire men spray the floats with water to freshen up the flowers. Hopefully all the flowers keep their fresh look for the next few days. 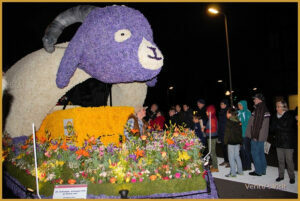 That very evening the floats pass through Noordwijkerhout, on Saturday morning they leave Noordwijk and the Flower Parade finishes in Haarlem, where all the floats can be admired one last time in the city center of Haarlem on Sunday. Till next year. 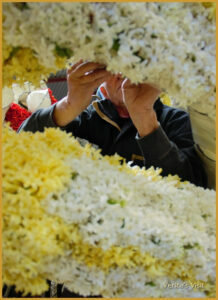 A new edition , a new episode of behind the scenes of the flower parade. A big thanks to all the volunteers for having given me the opportunity to enjoy and become not just a tulip maniac and a Keukenhof area fan, but also a Flower Parade (over)enthusiast. Spotting tulip fields near Keukenhof is not easy in the first week of April, but this one is just a bike ride away from Voorhout station. You planned a spring holiday in the Netherlands. Everything packed: sunglasses, travel guide, tank tops. You made a little plan: visit Keukenhof, see a bit of Amsterdam, maybe an authentic Dutch village, something like Volendam or no, make it Zaanse Schans. Great! You’re good to go. Then your plane touches ground in Amsterdam Airport, you get out and….uff, it’s terribly cold! And…it’s raining! Well, here’s an alternative day program that will still get you to Keukenhof.